There’s nothing like a stylish outfit to get you ready for a workout! Activewear has been taken to new levels over the past few years. Gone were the days where you would just pick a tank top or t-shirt paired with a basic pair of leggings to wear to the gym. Nowadays, activewear comes in so many styles and colours which means an endless array of brands to choose from. As a fitness enthusiast, I’m aware of the the different styles out there and most importantly, the different prices. In my opinion, you don’t need to spend an excessive amount of money on a fitness wardrobe. Yes, I do love the feel of some of my more expensive activewear pieces but the ones that I’ve bought for less than half their price are just as comfortable and stylish! I’ve tried and tested MANY MANY MANY fitness brands for you guys and have put together this post to give you an insight into where you can buy comfortable, stylish and most importantly, squat-proof activewear from for under £20 in the UK! I’ve also created a mini lookbook of 10 activewear pieces I’m feeling at the moment which I know you guys are going to love! This video is not sponsored by any brand because these are my genuine thoughts on my personal favourite and most affordable activewear brands. I do, however, use affiliate links. But wait……. Shhhhh I have a secret….. I know the world’s best kept secret regarding where to get branded sports apparel starting from £6 for Adidas sports bras! Yes, I’m really spilling the tea. However, there is a catch. I will only be revealing this secret to my subscribers so if you have not subscribed yet, click here to do so! I will be revealing my tea in my new BBBB Monthly Newsletter for the month of May. So for my subscribers reading this post, you guys will receive the world’s best kept affordable sports apparel secret straight to your inboxes! If you are not subscribed yet, please do so! Without further ado, here are my favourite affordable and stylish activewear pieces for under £20 plus my top picks! When it comes to stylish sports bras, it’s Forever 21 all the way! With so many different designs and colours, Forever 21 sports bras are so unique and comfortable. My wardrobe is filled with their bras and there is never a time when I wear one of their bras and I don’t get a complement (not to sound narcissistic haha). But it’s true! You can spot a stylish Forever 21 sports bra from a mile away and the best part is that they are always under £15 which is such a bargain compared to the typical sports bra which costs an average of £25 from what I’ve seen from my personal research. The one I’m wearing in the photos for this post is from…well you guessed it…Forever 21! So if you’ve seen pictures of me in any fitness apparel, chances are that 90% of the time, I’m wearing a Forever 21 sports bra. Some other honourable mentions are boohoo.com and missguided.co.uk. See where you can get the sports bra I’m wearing plus many more below! Grab them before stock runs out! When it comes to sports tops, I did some research for you guys and came to the conclusion that the best places to get stylish sports tops for under £20 are: Forever 21, Primark and missguided.co.uk. Do not sleep on Primark, guys! 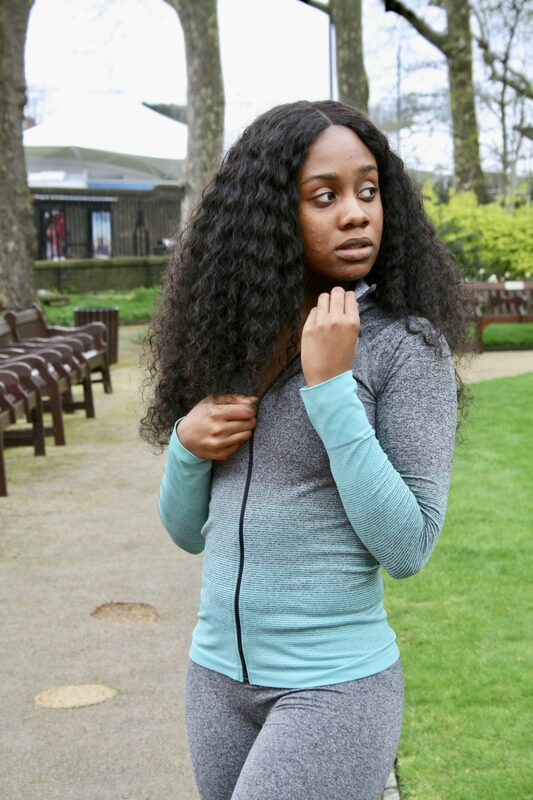 Most of their sports tops are under £10, like the one I’m wearing in this post! They are comfortable and made from stretchy, malleable material that is perfect for a workout! Head into your local Primark store and prepared to be amazed! This is the same for Forever 21, of course, but if you prefer online shopping, like me, then Missguided is also a great option! Find a similar sports top to the one I’m wearing below plus a couple more! When it comes to leggings, I’m incredibly fussy over where I buy them from. Like many of my African sisters, I find it difficult to find leggings to accommodate the curves I have going on below my torso…aka, the voluptuous African hips and booty! That is why when it comes to sports leggings, I always find myself gravitating towards seamless leggings as they are super stretchy, high waisted and fashionable and luckily they are a huge trend at the moment. It is either that the leggings don’t stretch enough, they leave a lot of extra fabric in the crotch region or they ride down during a squat. Well, I know where you can get the best seamless sports leggings that are squat proof from. As I said above, don’t sleep on Primark. The leggings I’m wearing in this post are from Primark! They are comfortable, squat proof and they look amazing! Honestly the best leggings I own. But you have to be careful. I would advise you to only buy the seamless pair if you go for any leggings under £20. Apart from seamless, I believe that you should’t compromise price on a pair of leggings. For my Primark leggings, you will have to find them in-store but here are a couple of other options. Don’t forget to subscribe and follow my social media!